5 STARR bass boat models are intended to quickly transport you and your boat to where the fish are hitting, and then return everyone safely back home once you’ve reached your limit. Each model is based on our tried and true Aluminum I-beam frame rails. This patented design continues to look sharp through years of service while the integrated gutter protects wiring and brakelines. Standard features include carpeted, adjustable main and target bunks, and carpeted inner fender boards offering protection for low slung hull designs. Torsion axles provide a smooth and quiet towing experience while disc brakes bring things to a smooth stop when necessary. Traditionally known as V-bunks, this system offers both high strength and a wide range of adjustability. Out of adjustment? There are shorter and taller bolster brackets available in many heights. Specifications subject to change without notice. Not responsible for typographical errors. Useful for some skiff applications. Carpeted bunk section positioned above and perpendicular to the trailer tongue. 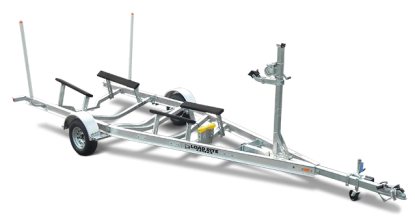 Provides an extra resting and balance point, and helps prevent keel contact with the tongue when loading in certain ramp conditions. Shown with optional aluminum wheels, spare tire, carrier, and LED lights.